Since I bought my house 6 years ago I have done one to two projects every year around the house and little by little we’re finally making it our own. One of the first things we bought upon moving in were new appliances. The thought of using someone else’s appliances kind of skeeved us out…plus they were pretty beat up. We bought a base model stainless steel refrigerator, stove & dishwasher. The fridge we purchased didn’t have any features except a water/ice maker. Yeah, from the start it was definitely an upgrade from the pre-existing fridge, but I can’t tell you how bummed I am that we wasted our money on this basic unreliable fridge. The ice maker broke in the 3rd year and the drawers started falling apart shortly after. Plus, after we had finally gotten to redoing our kitchen, we wished we had went with a better looking model because our new kitchen looked amazing but the appliances just didn’t have that same wow factor! 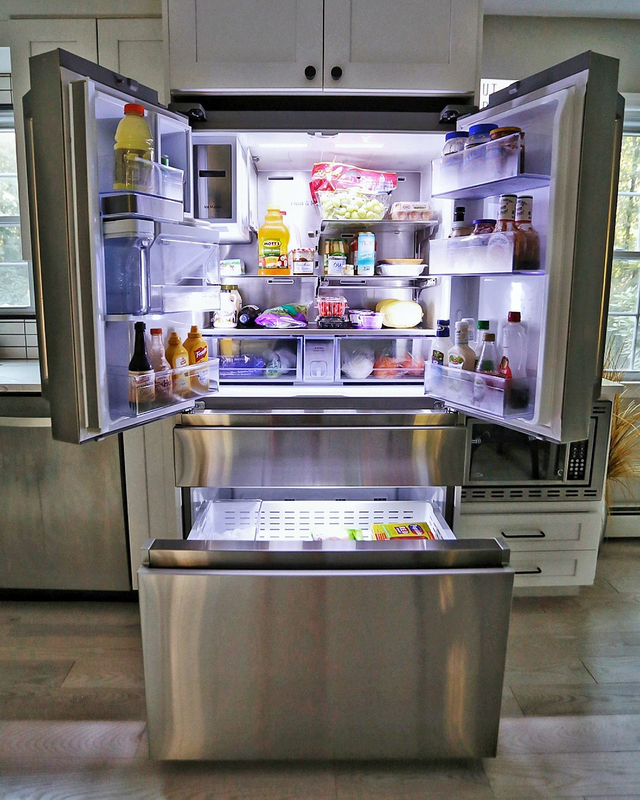 So, when I got the opportunity to get my hands on the new Samsung Family Hub Smart Refrigerator I was ecstatic! 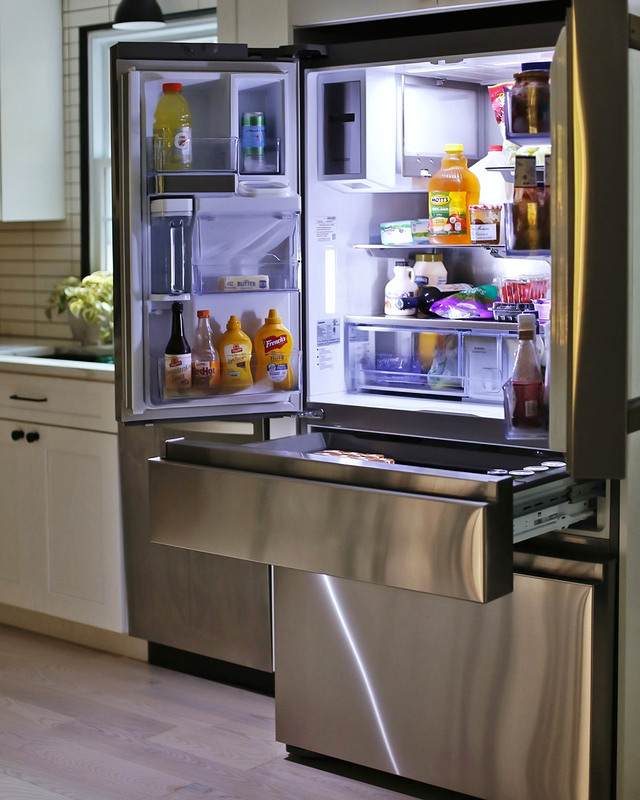 The first thing you notice when you see this fridge is the 21.5″ touchscreen. 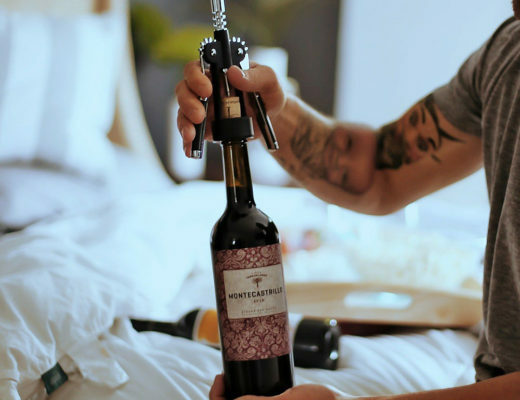 It definitely has to be one my (and the rest of my family’s) favorite features…not just because of how cool it looks, but because of all the features it now brings into your home. When I walk into my kitchen, the Family Hub is one of the first things that grabs my attention. To be honest, even though this fridge has more cubic feet than my last fridge, when I first opened it I thought it was going to be too small for me. I think the fact that there is a separate drawer (called the Flex Zone) makes the size seem a little deceptive. However, I was completely wrong about the size. 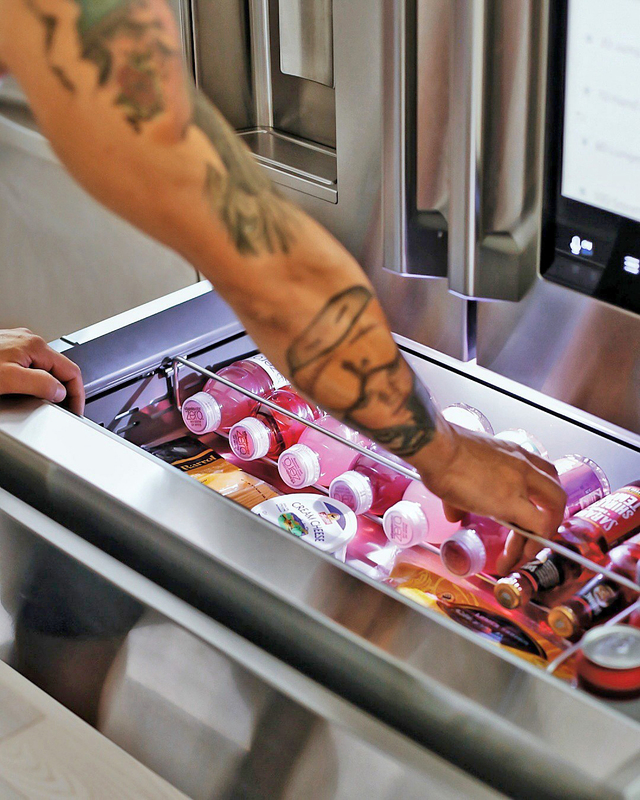 The way the fridge is set up allowing you to be able to customize the shelves and drawers really helps you keep everything inside the fridge organized and creates even more space! Honestly…it’s definitely helped to eliminate those “babe, where’s the mayo” moments LOL. Not only does my Samsung Family Hub have a water and ice dispenser, but it also comes with a built-in water pitcher that you can set to auto refill when you put it back in it’s spot! The pitcher also has a flavor infuser built in, which I love. Give me ice cold cucumber-flavored water any hot summer day! So this might be a little weird and out of the ordinary, but what I use our Family Hub the most for (besides keeping my food cold & organized) is for my workouts. Yes, my workouts! 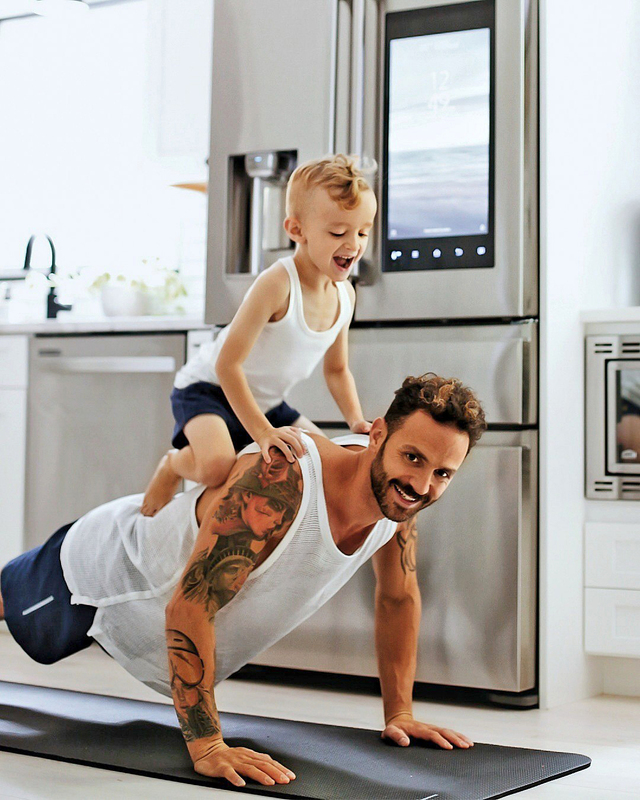 I usually go to the gym for about a half hour and work on a specific body part while I’m there, but then when I get home, after I play with Nate for a little, I always do an at-home WOD (workout of the day). Using the Family Hub’s wifi enabled touchscreen, I go to the Pinterest app and search for workouts. I then create a to-do list with my workout. This way I’m able to save it for another day and I’m able to cross off the exercises as they’re completed. I used to have a drawer full of papers with all of my workout lists, but it’s safe to say I’ve since thrown those out. This is much more efficient for sure! I then go to one of the many music apps to stream some music to get me pumped, like iHeartRADIO. One of my other favorite features is the Shopping List app. This is an all-around family favorite! I hate going to the supermarket and hate wasting an hour or two with the whole process in general, so anything that can help speed it up is a win. Once you download the hub’s shopping list app on your phone, it all gets synced up. This allows you to create a shopping list which will then show up on the hub, my phone, and my wife’s phone. When anyone edits the list it will update across all devices! Now when you’re doing your shopping, as you grab what you need, you can cross it off the list and it will cross off on everyone’s list. It’s amazing! This way we can split up the shopping and really cut our time in half. No more screaming across the store, “babe, grab bananas”, or “did you get the milk? !” LOL. If I’m at the supermarket alone, while my wife’s at home, she just adds new grocery items she remembers to the hub app and it will pop up on my phone. We really love it! The app will also take things like strawberries and let you know that in 2 days they are going to go bad. These little reminders are super cool because in the past we’ve definitely wasted way too much fruit in this house, but since the hub have become a lot more aware of our fridge items. Did I mention I can also see inside my fridge from the outside? 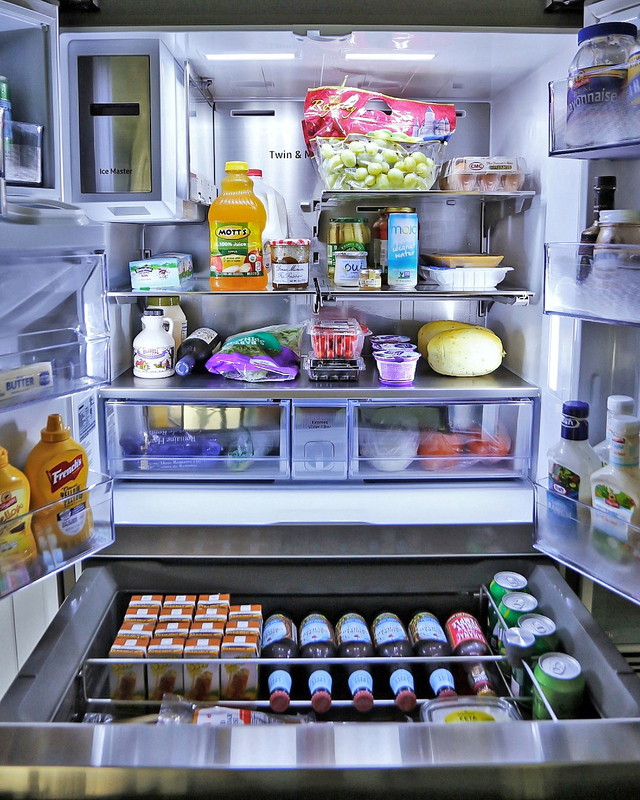 If I’m at the store and can’t remember if I’m low on mike, I can just view the inside of my fridge on my phone and check. My family hub has 3 interior cameras that takes a photo every-time I close the door and keeps me up to date! There are seriously so many cool features to my Samsung Family Hub, that I could go on and on, but another one of my faves is the Memos app. I hate waking up so early to go to work and leaving my family without getting a chance to talk or say goodbye in the morning before I leave. So I love that I can quickly type them a cute note that will show right on the fridge’s screen. It might just say “I love you” or “Sorry, I’m busy, but I’ll call you later” or silly things, but just knowing I was able to drop them a line for them to know I’m thinking about them makes me feel better and they love getting my surprise notes throughout the day! We seriously love our Samsung Family Hub and little by little are incorporating more and more features into our everyday routines. Besides keeping us all connected and making some of our tasks a lot easier, overall we just feel more organized. And in this house with all the running around we do, between work, blog projects, events, everyday commitments & activities and just life in general, feeling more organized and connected definitely helps keep you feeling on task and able to get things done a lot quicker!